This Light Award is sponsored by Your Invisible Power. Consuelo used to work as a receptionist at a school. She would also do some sewing jobs for the school for extra income. After some time she left her job at the school to devote herself to tailoring. She does not regret this decision because she is doing very well. Consuelo makes sweatshirts, uniforms, jackets, etc. During the school year, her work increases and she has to hire people in order to fill her clients' orders. As a result of her work, Consuelo was able to help her children with their education and she is now able to help her grandchildren. What she would most like in the future is to be able to own a home where she can have her own sewing workshop because she is currently renting her home. Consuelo would like to specialize in making lingerie. She would use this loan to purchase materials and to make a pending trip. EDAPROSPO is a big help to her and her fellow members of "OBRAS" as they have all prospered in their small businesses and there is a lot of enthusiasm and support between them. *Consuelo is pictured standing fourth from the left. 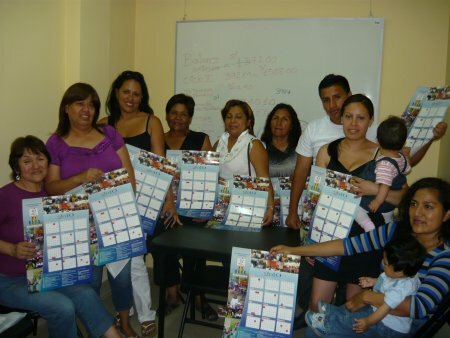 The group is photographed showing EDAPROSPO's calendars.